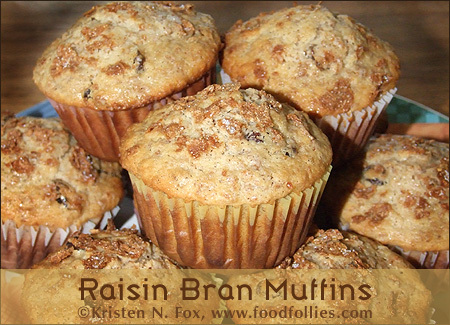 Yup, I whipped up some muffins made from raisin bran cereal, of which we had much, and of the mostly stale variety! I love finding a new use for things I’d otherwise have to throw away, and as often as we found ourselves with a partial box of stale raisin bran sitting around (shall have to investigate that), I just never got around to making these before. Mix the first five (dry) ingredients together in a medium sized bowl and set aside. In a large mixing bowl, mix cereal with milk, and let set for a few minutes to soften the cereal. Add the egg and vegetable oil and stir until blended. Add the flour mixture to the cereal mixture, stirring only until ingredients are blended well. Either use cooking spray in a muffin tin or line the muffin tin with paper muffin liners. Then divide the batter between all twelve muffin spots – they will be pretty full. Before putting the muffins in the oven, sprinkle a little bit of crumbled bran flakes and then sprinkle a little sugar over each muffin, for a crunchy topping.